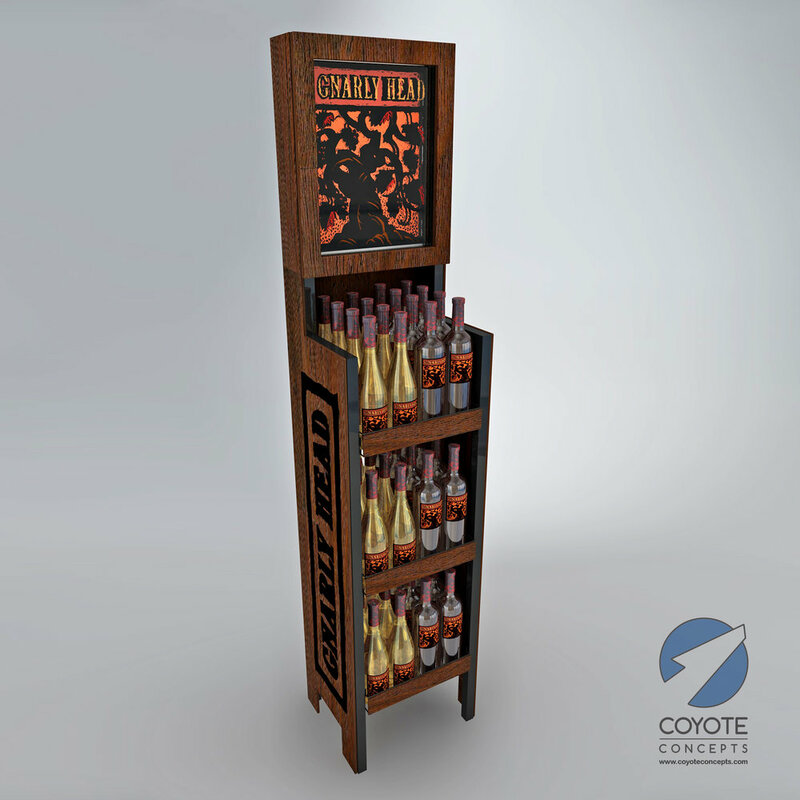 Back in 2008 we had a chance to generate some ideas for a small footprint floor display for Gnarly Head wines. 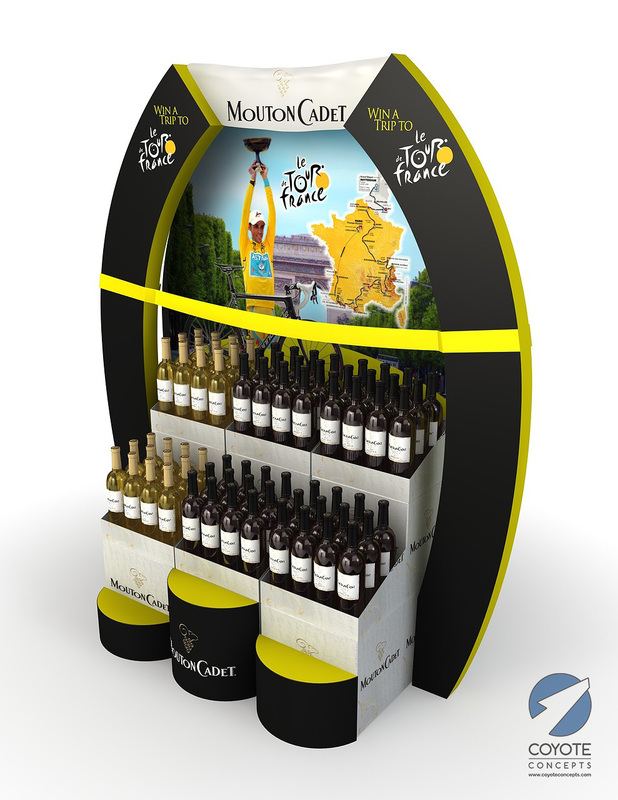 The colorful, rustic logo evoked a rustic but premium feel, so we did our best to interpret it into a three dimensional form that would meet their budget, bear the significant weight of 3 cases of wine, knock down flat for easy shipping and assemble with minimal tools. We took special care to give the logo some dimension using die cuts, screened transparent panels and distortion-printed vac-forms. The resulting designs are below. Illy is the kind of brand that designers love to work with. Their brand identity adheres well to the essential principles of good design that we're trained to uphold: Simple, clean, bold, clear, functional, instantly identifiable. That doesn't mean, however, that in designing a floor display for the brand that you shouldn't inject a dose of whimsy just to tone down the austerity a little in a ploy for better visibility in the visual chaos of the average store. The trick here is to apply a measured approach so that the brand identity is maintained. That was our aim in presenting the following concepts. What do you think? Need some fresh, realistic, real-world solutions for your next project? Click here! It's long been a standard marketing practice for brands to temporarily align themselves with a team or event to create programs with the goal of increasing awareness. 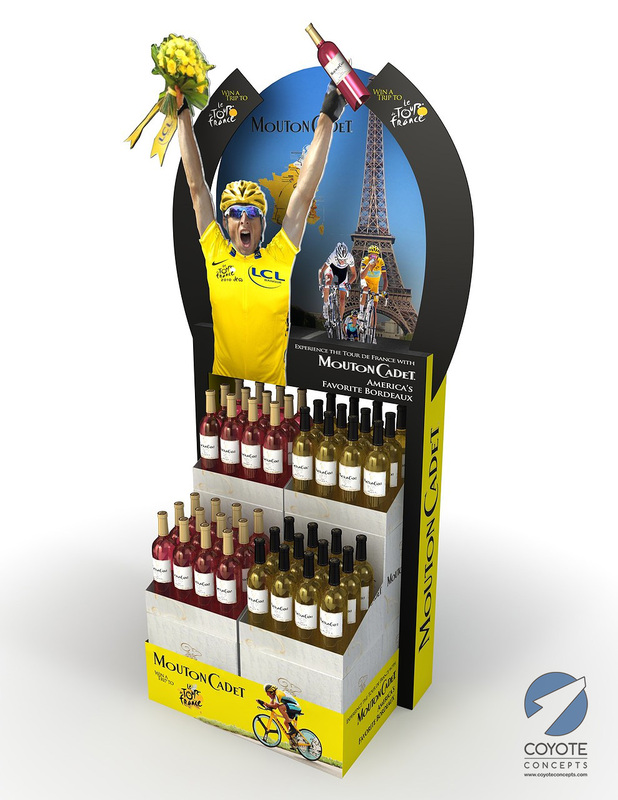 This was the case when Mouton Cadet wines hooked up with the Tour de France back in 2010 and we were consulted to provide creative tie-ins between their wines and the wildly popular bicycle race. An agency provided us with some graphic elements, desired footprints were defined, and we went to town creating some big, dimensional, die-cut corrugated displays to show off the alliance as boldly as possible. We provided a lot of work on this one. The images below only comprise a portion of the project. 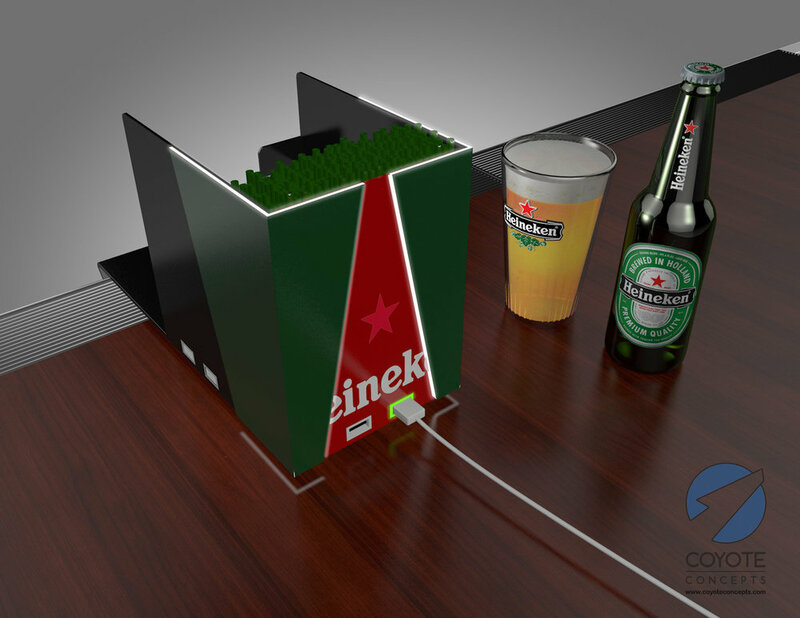 Heineken was looking for a bold presence at the bar, but they didn't want to just stick a sign in a frame or print up thousands of fragile table tents that would just get ignored and destroyed in a few days. They wanted something with longevity that would attract attention and encourage some kind of engagement with the consumer and/or bartender by providing utility. 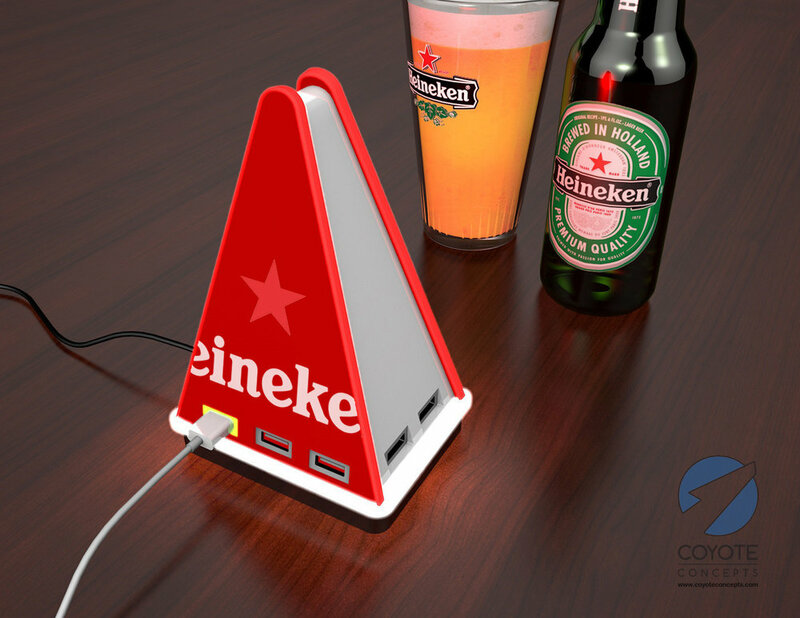 Collaborating with a long-time display company client company, we designed and illustrated several ideas which showcased the brand with LED lighting while integrating both existing bar accessories like napkin and straw holders as well as providing USB charging ports as a free convenience for bar patrons. How do you make a tire display look upscale? This was the challenge when we were asked to design a Pirelli tire display for BMW dealerships. Our answer took the form of silver powder coated steel structure comprised of sleek sections using a visual vocabulary of ellipses. A colorful banner provided a callback to Pirelli's racing heritage, and the BMW icon was glorified with a glossy dimensional treatment on top. Coppola Wines needed a way to showcase their signature "Director's Cut" wine in a floor display that would provide them with maximum merchandising capacity while communicating their brand identity in simple and bold way. We decided to design a simple round metal rack and kick it up a notch by incorporating a helical banner to echo the packaging, then added a film reel base. It was a hit! 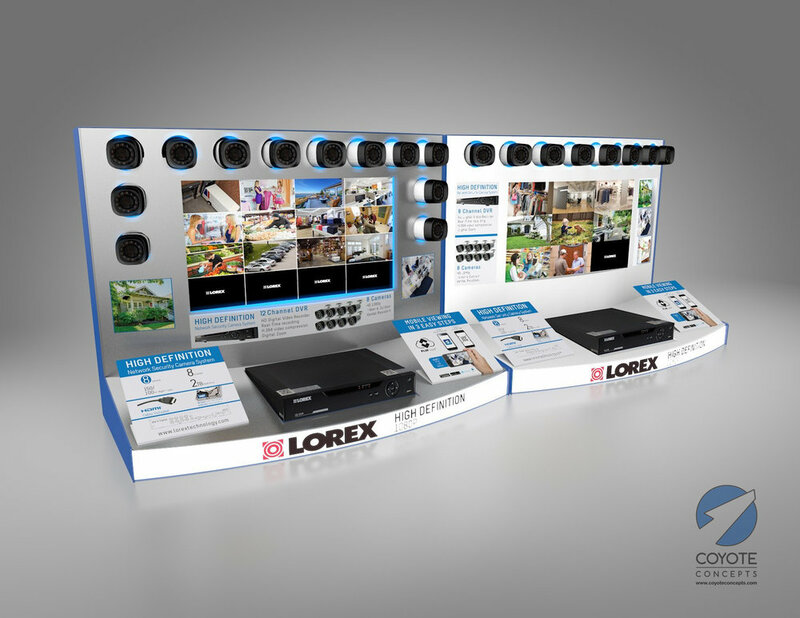 We had an opportunity a few years back to design a large counter display for a major security camera manufacturer who desired a strong presence in Costco. Molding wasn't an option, so we tried to stick with forms that could be achieved with sheet metal construction. The graphics were supplied by the customer, so our challenge was to provide space for them in a way that told the story to the consumer in as logical and concise a way as possible. After an initial ideation round, we narrowed it down to two final directions and then picked a winner based on its simplicity and cost. Ultimately two variations were manufactured and placed in stores nationwide. What do you think? Download a 3D model of the security camera and DVR we created for the above concepts by clicking on this text. As a structural material, corrugated cardboard can be incredibly versatile and remarkably strong. 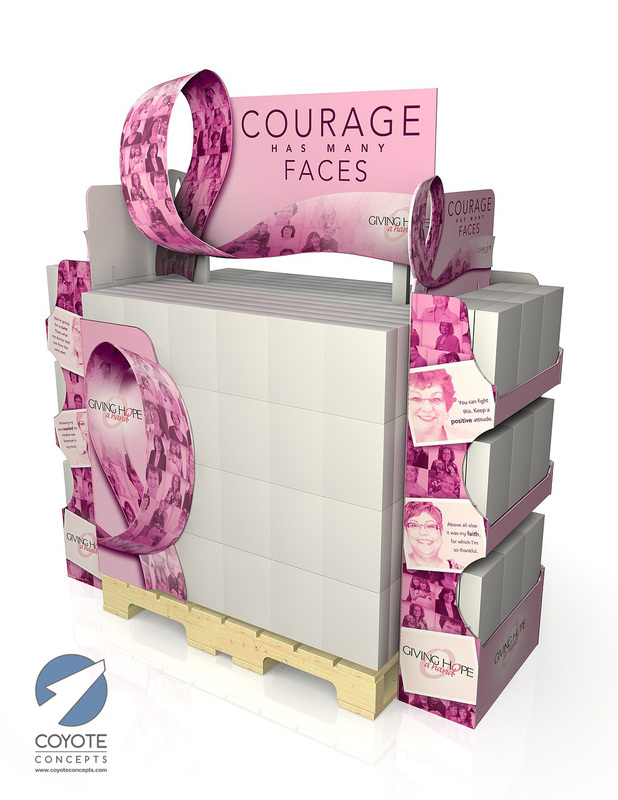 With the proper graphic treatment, strategically placed folds, and a few interesting die-cuts, a simple graphic idea can be transformed into an attention-grabbing visual exhibition that not only supports heavy packaging and boosts brand awareness, but also moves a heck of a lot more product out the door. Few materials offer similar retail power so economically. It's not surprising it's so popular. Designing a display in corrugate can be challenging. It demands an approach which is the opposite of designing for a more permanent material (i.e., metal or wood) where you must first create a framework and then look for opportunities for graphics. With corrugate, you often start with the graphic direction first and then try to figure out how to slice and dice it into pieces which will lend themselves to the desired scale while also providing opportunities for structural integrity. 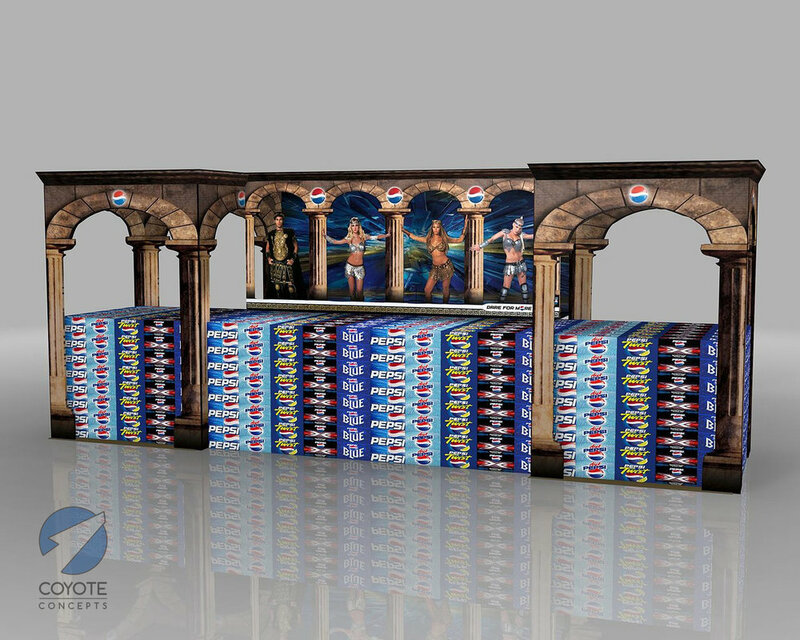 One who designs both temporary and permanent displays must have a thorough understanding of structure, graphics, budgets, and manufacturing limitations in order to generate ideas which have any hope of ending up in stores. These are some of our favorite cardboard sculptures from the last 15 years. What do you think? 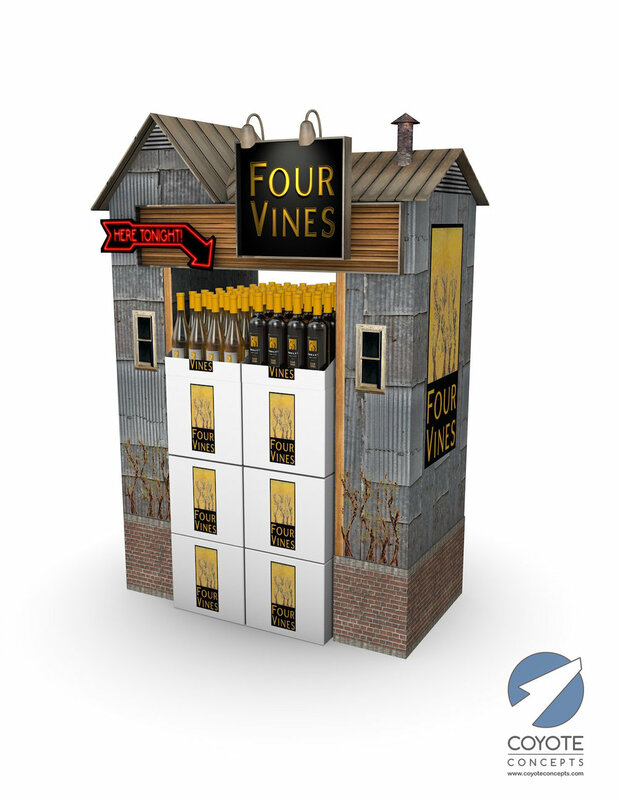 If you would like to purchase a 3D model of anything depicted above, go to our contact page and send us a message. We'll get back to you as soon as possible. 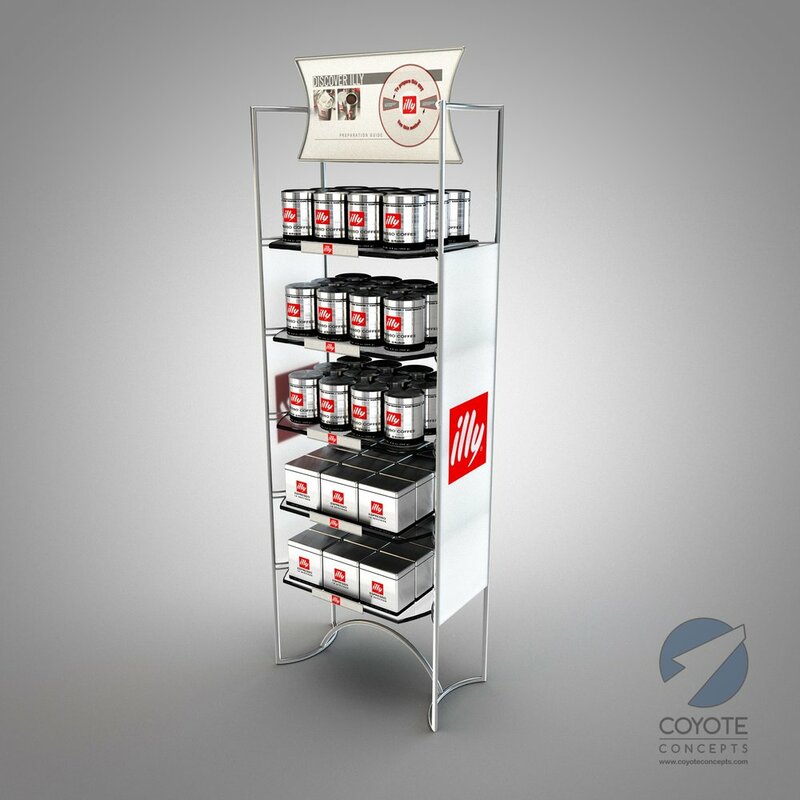 How do you create a versatile structure to securely hold, organize, and display energy shots, plus make it easily sit on a counter, hang on the side of a cooler, or attach to a glass door? Our solution involved a steel ring structure featuring spring clips to grip the product, plus four supports designed to accommodate magnets, suction cups, or rubber feet. It then completed the look with large interchangeable vacuum-formed icons to trumpet the brand to the consumer. 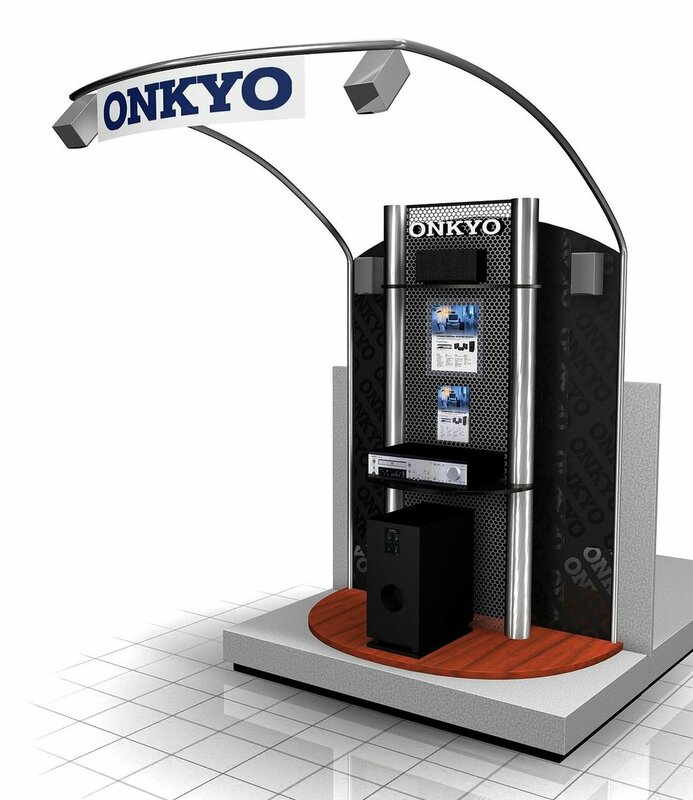 Back in 2002, Onkyo needed a high-end looking display to showcase their latest surround sound system. The challenge was in devising an aesthetically appealing method to suspend the rear speakers behind the consumer so that they could enjoy the full audio experience. I came up with a few options using powder coated metal tubing. I also had some fun experimenting with an array of finishes and graphic treatment options for the structure of the display. These are the result. The renderings look crude to me now! 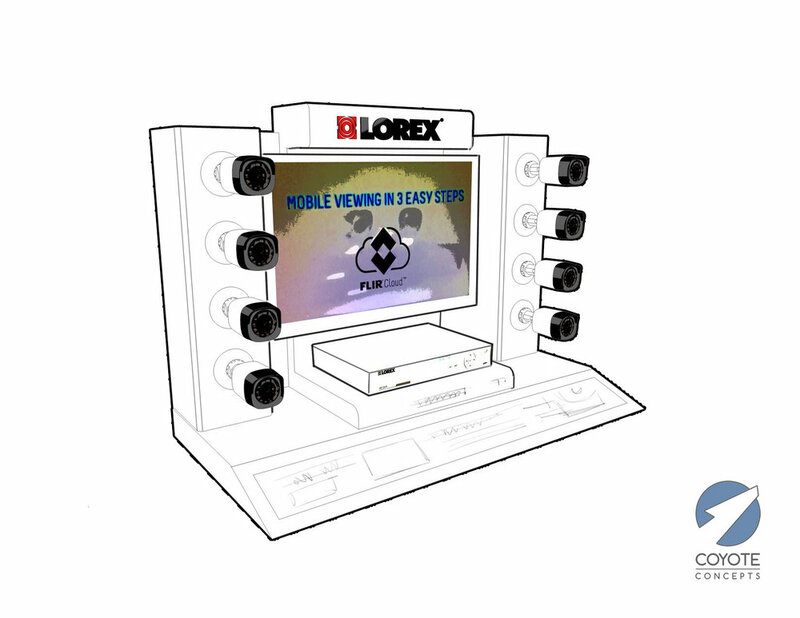 3D modeling and rendering have come a long way since then. 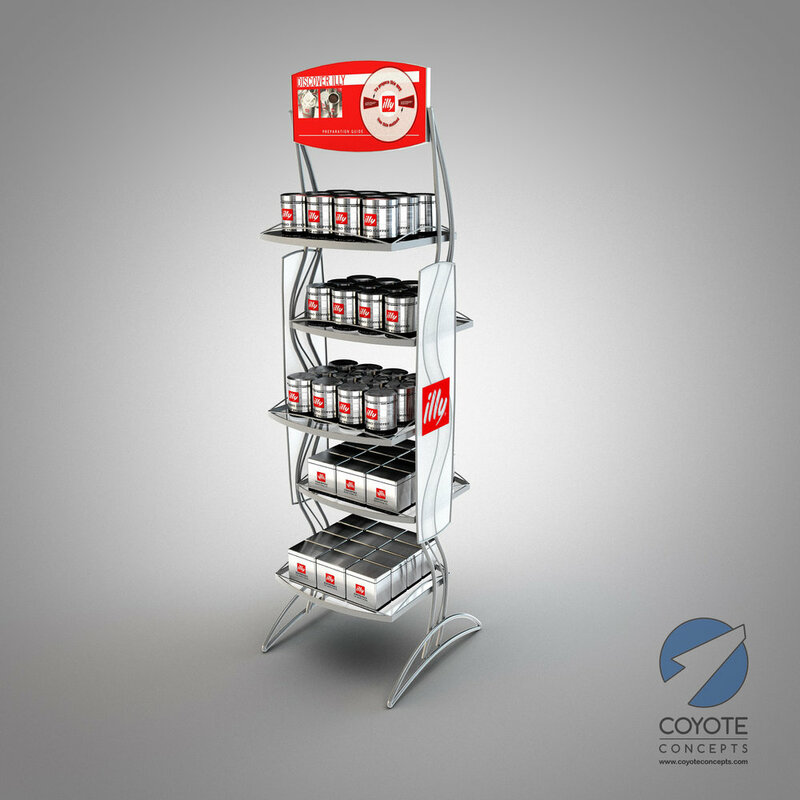 Mobil needed a floor display that would showcase their flagship motor oil. They wanted it to convey an identity that's as tough, durable, and long lasting as the product itself. We chose to integrate components molded in a silver finish to match the packaging, ribbed details, diamondplate, and hexagonal bolt heads. A large interchangeable header graphic area with a sample bottle and a literature pocket on the side completed the look. Few brands have as well-defined an identity as the brand pictured below. Showcasing this identity while taking into account budget, scale, and structure is not a task for lightweights. It takes years of practice to be able to deliver concepts that hit every mark. Designers like to complain about the difficulty of providing a fresh, eye-catching designs under such daunting constraints, but often it is precisely these kinds of challenges which ultimately produce the most noteworthy results. We understand this, and welcome the challenge. These endcap concepts provide a good example. Boost your creativity with a side hustle! Every professional I know understands the frustration of getting stuck in their chosen area of expertise. It is a cruel paradox that in order to advance your career, it is necessary to specialize, but in doing so you may also discover that years of dedication to your specialty have left you feeling a bit bored. What to do? Branch out! If you're a designer, polish up your artistic skills! You may not find someone to give you a paying project in another creative niche, but you can make a nice side hustle out of it if you're willing to give up a little of your spare time. Today's post is my current side hustle. I long time friend of mine wrote a simple children's book, and she asked me if I could provide the illustrations. Perfect opportunity to sharpen my sketching skills, have some fun in the evenings, and who knows? Maybe the book will sell and I'll end up making a bit of extra cash! If not, it will still be a fun and rewarding experience. The book will ultimately consist of 15 illustrations. This one will appear in the middle. I started with some rough sketches to capture the author's writing, did some research online to figure out a style, and experimented with color and lighting in Photoshop and Autodesk Sketchbook on a Wacom Cintiq monitor. What do you think? 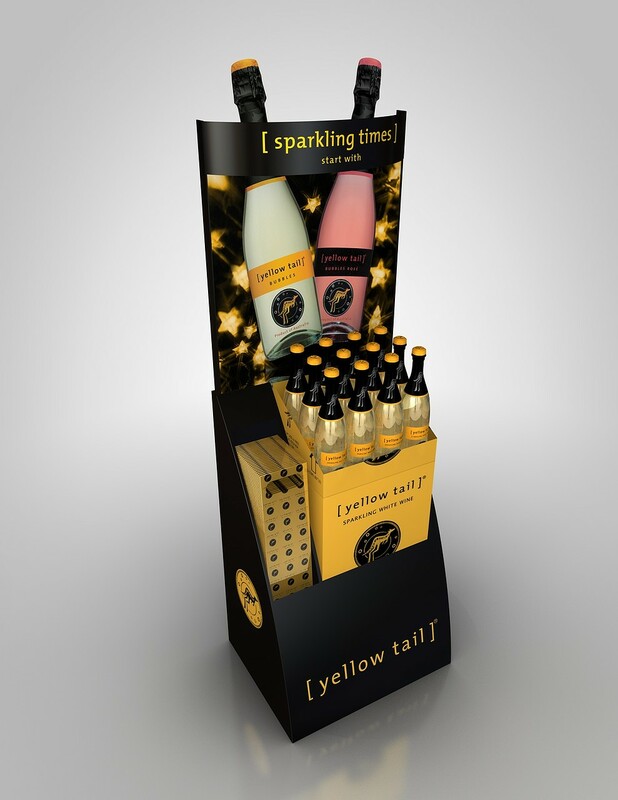 Let's usher in the new year with a few examples of the many sparkling wine display concepts we've created over the years. 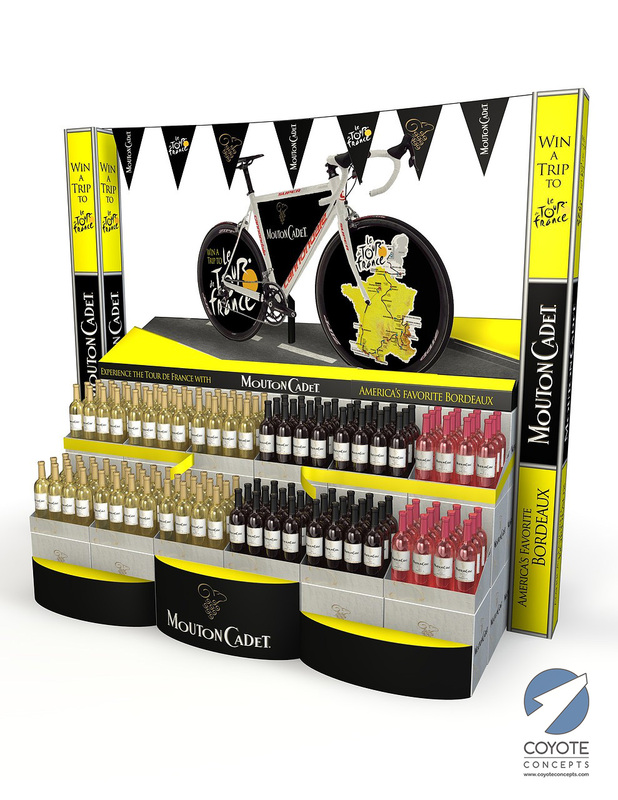 We've created eye-catching permanent and temporary concepts for a slew of brands with a wide range of budgets. Call us if you need some fresh ideas!